Precious metals spot prices continue to more or less flat-line this month as the market waits for a new catalyst. Gold prices closed yesterday in quiet holiday trading at $1,735; silver closed at $33.71, platinum at $1,651 and palladium at $700/oz. All the metals have rallied this morning. Another can-kicking resolution of the Greece debt situation, along with news out of the Middle East regarding decreased oil production and Iran's refusal to sell its oil to France and Britain, seem likely to drive metals prices higher in the days ahead. A major catalyst driving prices higher in January off of the lows from December's correction was currency depreciation. Metals-supportive monetary conditions can be expected to persist in the months and years ahead (into late 2014 at least). Money Metals Exchange fields several calls every week from frustrated buyers of coins sold to them as "numismatic," "collectible," or "proofs." The calls come after these individuals have discovered that their "rare" coins have severely underperformed bullion prices. In many cases they find out that the coins they bought aren't rare at all, and the gains they were told to expect failed to materialize – thanks to the ridiculous markups they paid when they bought. This story is unfortunate, and not just for the victims. The alleged misconduct of big name (and big advertising) rare coin dealers, such as Goldline (which is facing a 19-count criminal fraud complaint in California for its bait-and-switch tactics), is stigmatizing precious metals dealers in general. These "numismatic" coin companies are becoming infamous for "boiler room" sales techniques and rip-off pricing – and for leaving a trail of customers who feel cheated and misled. Also among the losers are members of the general public who hear the horror stories and get too spooked to protect themselves from inflation and financial turmoil by buying the "good stuff" – i.e., gold and silver bullion coins, rounds, and bars at prices near their melt value. While the profit margin for dealers themselves is razor thin, this is the only form of precious metals Money Metals Exchange recommends or sells. If you have been a victim of Goldline, you can do something. The city of Santa Monica, CA is still accepting customer complaints in its criminal suit against Goldline. The sleazy tactics of rare-coin rip-off artists have attracted the attention of Congress, which held hearings on the industry's business practices. Regardless of whether Congress and local authorities have a genuine interest in protecting the public from fraud, the danger is that onerous new regulations will be slapped on all coin dealers that drive up costs of doing business and potentially threaten customers' privacy. "I Made the Mistake of Buying Numismatics. Should I Sell Now?" 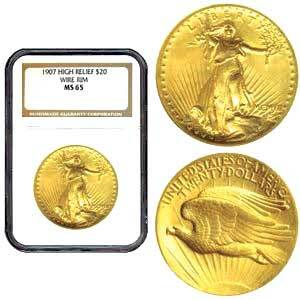 Customers often ask whether or not they should sell the collectible coins, now that they have realized their error. Our advice: probably not – because that horse is already out of the barn. On resale, the coins may only be worth their melt value, or perhaps slightly more. After the upfront losses on the phony "collector's premium," the coins should perform like bullion. The metal content will support their value from here on out. So unless you can still sell your collectible coins at a sizeable premium over melt value and use the proceeds to buy even more ounces of bullion – in other words, increase the size of your stack – then it likely makes sense to just hang on to the "rare" coins for the duration of the bullion market unless you simply need the cash. Just make sure you don't buy any more of these highly speculative and generally lousy "investments" unless you are a serious collector who knows what you are doing! For more information about the myths and pitfalls of rare coins, visit this page on Money Metals Exchange'swebsite. We also just released a comprehensive report on Morgan Silver Dollars, one of the most common inpidual items sold by these unethical dealers. Physical buying and selling activity edged up a bit again from the prior week, but the market remains relatively quiet overall. Once again, silver purchases by Money Metals Exchange customers outpaced gold purchases by a 2 to 1 margin. Customer selling was practically non-existent. Premiums fell slightly ($0.05 – $0.15) on a few silver products, including pre-1965 90% coins, American Eagles, and Maple Leafs. Premiums on gold products held steady.